Q: How Does Non-Line-of-Sight Reception Differ From Multipath Interference? A: It is well known that GNSS signals may be reflected by buildings, walls, vehicles, and the ground. Glass, metal, and wet surfaces are particularly strong reflectors. These reflected signals can interfere with reception of the signals received directly from the satellites, a phenomenon known as multipath interference, or just multipath, because the signal is received via multiple paths. However, cases also occur where the direct signal is blocked and only a reflected signal is received. This non-line-of-sight (NLOS) reception is particularly common in dense urban areas where tall buildings block a lot of the signals. Figure 1 (see inset photo, above right) illustrates both phenomena. 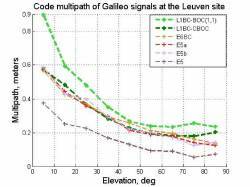 Within the GNSS community, it is commonplace to classify NLOS reception as multipath. However, the two effects are not the same, although they sometimes occur together. If the signal is only received via reflection, no multiple paths exist, only a single reflected path. The ranging measurement errors that result from NLOS reception are quite different from those produced by multipath interference and are not corrected by most multipath mitigation techniques. Therefore, to improve positioning in urban areas by addressing NLOS reception, we must first acknowledge its existence as a separate phenomenon. This article describes the differences between multipath and NLOS reception, and explains why different techniques are generally required to mitigate their effects. These techniques may be antenna-based, receiver-based, or post-receiver, and many may be used in combination. Where multipath interferes with directly received signals, the reflected signals distort the code correlation peak within the receiver, as shown in Figure 2 (see inset photo, above right). As a result, the code phase (used to generate the pseudorange) of the direct line-of-sight (LOS) signal cannot be accurately determined by equalizing the power in the early and late correlation channels. A positive ranging error occurs when the direct and reflected signals are in-phase, a phenomenon known as constructive interference, while a negative ranging error occurs when the signals are out-of-phase, which is known as destructive interference. The magnitude of the resulting code-tracking error depends on the path delay of the reflected signal with respect to the direct, the relative strengths of the two signals, their phase difference, and the design of the receiver. The maximum pseudorange measurement error due to multipath interference from a reflected signal of the same amplitude as the direct signal is half of a ranging code chip (e.g., 150 meters for GPS C/A code). However, most receivers are designed to produce smaller errors than this. Where the path delay exceeds 1.5 chips, the correlation function is sufficiently undistorted so multipath interference does not occur. Multipath interference also affects the carrier-phase, Doppler shift, and carrier-power-to-noise-density ratio (C/N0) measurements. These effects are largest when the path delay is shortest because these measurements are all based on the prompt correlator outputs. The maximum carrier-phase tracking error due to multipath interference from a reflected signal of the same amplitude as the direct signal is a quarter of a wavelength (e.g., 4.76 centimeters for GPS L1). Further information on multipath interference may be found in standard GNSS and integrated navigation textbooks. NLOS reception occurs where the direct LOS signal is blocked and the signal is received only via reflection. The pseudorange measurement error is therefore equal to the path delay, the difference between length of the path taken by the reflected signal and the (blocked) direct path between satellite and receiver. This error is always positive and, although typically tens of meters, is potentially unlimited. Signals received via reflections from distant tall buildings can exhibit errors of more than a kilometer. The corresponding carrier-based ranging error is within half a wavelength of the pseudorange error (modulo one carrier cycle) as the path delay is the same, but a phase change occurs on reflection. The strength of NLOS signals varies greatly. They can be very weak, but can also be nearly as strong as the directly received signals. As high-sensitivity receivers can acquire much weaker signals, they can therefore receive significantly more NLOS signals. NLOS reception and multipath interference sometimes occur together. The most obvious case is where the direct signal from a particular satellite is blocked and multiple reflected signals are received. In this case, the combined ranging error may be thought of as the sum of an NLOS error due to the strongest reflected signal and a multipath error due to the additional reflected signals interfering with the strongest signal. However, another scenario is where the direct signal is attenuated or diffracted such that it is weaker than a reflected signal. In this case, the receiver will typically track the reflected signal, resulting in an NLOS error, which will then be subject to multipath interference from the direct signal. Signals received directly from GNSS satellites have right-handed circular polarization (RHCP), while most reflected signals have left-handed circular polarization (LHCP) or mixed polarization. A well-designed GNSS antenna is at least 10 decibels more sensitive to RHCP signals than LHCP signals at normal incidence. This reduces the magnitude of both the code- and carrier-tracking errors due to multipath interference. The exception is low-elevation signals, for which the antenna has very little polarization discrimination. However, where space permits, a choke-ring antenna system may be used to attenuate low- and negative-elevation signals, reflected and direct. The antenna design does not directly mitigate NLOS reception unless it attenuates the signal below the receiver’s tracking threshold because the ranging error is not related to the received signal strength. However, it does aid the identification of NLOS signals through their lower C/N0, values, enabling them to be excluded from the navigation solution or downweighted, as appropriate. C/N0-based NLOS detection may be enhanced using the dual-polarization antenna technique. This uses an antenna with both RHCP and LHCP outputs, which are then processed in separate receiver channels. An LHCP C/N0 that is larger than the corresponding RHCP C/N0 is indicative of an NLOS signal. This is effective at detecting NLOS reception except for low-elevation and doubly reflected signals. Polarization-sensitive antennas are standard for professional GNSS user equipment. The smaller patch antennas used for applications such as road vehicle navigation offer less polarization discrimination. However, smartphone antennas are linearly polarized and thus are equally sensitive to direct and reflected signals. Furthermore, the antenna gain is low along the axis of the antenna, resulting in a low C/N0 for some of the direct signals. For high-budget applications, a GNSS antenna array may be used to measure the angle of arrival (AOA) of the signals, essentially inverting the well-known interferometric attitude determination technique. NLOS and directly received signals may then be distinguished by comparing the measured lines of sight with those predicted from the satellite ephemeris data. This technique should also be suitable for detecting strong multipath interference. For large vehicles, such as ships, trains, and large aircraft, and some static applications, multiple GNSS antennas (with associated receivers) may be deployed at different locations. NLOS and multipath-contaminated signals can then be identified through inconsistencies in the measurements made from the different antennas. Another hardware-based approach uses a panoramic sky-pointing camera or a camera array to generate an image of the entire field of view above the receiver’s masking angle. If the orientation is known, the blocked and unblocked lines of sight may be determined from the image, enabling NLOS signals to be identified. This method does not detect multipath interference. A number of techniques mitigate the effects of medium-delay (10−100 meter) multipath interference on pseudorange measurements by increasing the resolution of the receiver’s code discriminator, effectively enabling the direct and reflected signal components to be separated. Examples include narrow correlator spacing, the double-delta discriminator, the gated correlator, the multipath-estimating delay lock look, and the vision correlator. These techniques are a standard feature of professional grade GNSS receivers. New techniques have been developed that separate out the components of a multipath-contaminated signal in the Doppler domain. However, none of these methods have any effect on NLOS reception as no direct signal is available to recover. Vector tracking, which combines signal tracking and position determination into a single process, can pre-vent NLOS reception via distant reflectors by preventing the receiver from locking onto those signals. Multipath interference affects code- and carrier-based ranging measurements differently; it also produces different errors on different frequencies. Multipath errors can therefore be detected and corrected by comparing different measurements of signals from the same satellite. An example is carrier smoothing, which can average out most of the code multipath error for dynamic applications. However, these techniques do not work for NLOS reception, because the resulting ranging errors are dominated by path delay, they are essentially the same for both code and carrier and across different frequencies. Where a multi-constellation GNSS receiver is used, many more measurements are typically available than the minimum needed to compute a position solution. Consequently, a better position solution can generally be achieved if those measurements least likely to be contaminated by NLOS reception or multipath interference are given the highest weighting and those most likely to be contaminated are excluded altogether. As discussed previously, the measured C/N0 is normally lower for NLOS signals, although less so for smartphones because of their antennas. Similarly, signals from low-elevation satellites are more vulnerable to a variety of ranging errors, including NLOS reception and multipath interference. Consistency checking operates on the principle that if position solutions are computed using combinations of signals from different satellites, those obtained using only the multipath-free direct-LOS signals should be in greater agreement than those that include multipath-contaminated and NLOS measurements. The same principle is used for fault detection in receiver autonomous integrity monitoring (RAIM). Thus, measurements that exhibit large errors are identified regardless of whether those errors are due to NLOS reception, multipath interference, or another source, such as atmospheric refraction or a fault. Consistency checking can successfully eliminate NLOS and multipath-contaminated signals in environments where the majority of signals are received by direct line of sight with little multipath contamination. However, in environments with multiple NLOS and multipath-contaminated signals, it is unreliable. New “bottom up” consistency checking techniques based on subset comparison are more reliable than the conventional “top down” sequential testing approach. However, further research is needed to achieve the full potential of this approach. Where positioning is Kalman filter–based, innovation filtering can also identify inconsistent measurements using information from previous epochs. 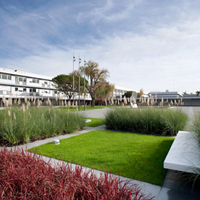 A 3D city model may be used to predict blockage and reflection of GNSS signals. Where the user position is known, identification of NLOS signals is straightforward. Otherwise, signal reception at multiple candidate positions must be considered, which is more challenging. With sufficient processing resources, a city model may also be used to correct NLOS ranging errors and predict multipath interference. Correction of multipath errors is theoretically possible, but requires a very accurate model because of the sensitivity to the phase lag of the reflected signal. To conclude, non-line-of-sight reception is one of the most important contributors to the GNSS position error in urban environments. The error characteristics are quite different from those of multipath interference and different techniques are needed to mitigate them. Therefore, NLOS reception should be treated as a separate error source by the GNSS community. Further discussion of NLOS and multipath mitigation techniques, together with a list of references, may be found in a paper by P. D. Groves et alia, “A Portfolio Approach to NLOS and Multipath Mitigation in Dense Urban Areas,” Proceedings of ION GNSS+ 2013, which is also available from UCL Discovery.